bebop spoken here: CD Review: Fergus McCreadie Trio - Turas. Fergus McCreadie (piano/compositions); David Bowden (bass); Stephen Henderson (drums). Our reviewer from north of the border recently reported on a live gig by the Fergus McCreadie Trio at the Eyemouth Hippodrome and was very impressed as you will gather from Kay's review. Less than a week later, they were playing on the concourse at GIJF. Unfortunately, such is the nature of multi-stage festivals, I was committed elsewhere and missed what I'm sure was a very lively set. This disc allows me to play catch-up as the material played at the gigs will, I'm sure, equate to what they play here on this, their debut album. It's a jazz album with a difference inasmuch as McReadie's compositions successfully create a fusion between jazz and Scottish Traditional Music. This fusion continues through the solos and, at times. I wasn't sure whether to do an impromptu jazz dance or to invite the neighbours to join me in an eightsome [reel!] Jesting apart, the two formats work together seamlessly, suggesting that Scottish jazz has a more recognisable national identity than that played by Englishmen and, probably, many Americans. If this be the case then it is due in no small part to the likes of McReadie and other emerging young talents springing up like heather in The Highlands. McCreadie draws parallels with jazz in Norway which has always managed to find common ground with Traditional Norwegian Folk Music best exemplified by musicians such as Jan Garbarek and Arild Anderson in the 80s/90s. 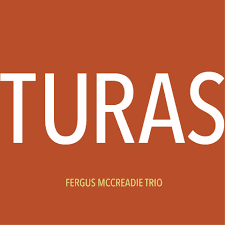 Turas is the Gaelic word for journey and several of the tracks do take us to a few places although you'd never know from trying to read the titles on the album cover. Fortunately, Google came to the rescue and led me to the pianist's website where you can find the titles and hear a sample of one of the pieces and maybe buy..
A name to keep a watch out for.